Temnospondyls were an order of amphibians that evolved during the Carboniferous period, perhaps around 350 million years ago, and were successful during the the Carboniferous, Permian, and Triassic periods. The majority of them became extinct at around end of the Triassic, but some survived through the Jurassic and into the Cretaceous, with the last Temnospondyls dying out around 100 million years ago. Temnospondyls varied greatly in size and shape. The largest was Prionosuchus, which was in fact the largest amphibian known, and which could grow as long as 30 feet (9 meters). 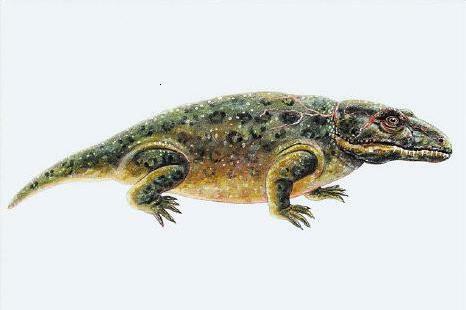 In terms of shape, some Temnospondyls resembled newts, and in some cases even retained gills, some grew robust limbs and adapted to life on land (although these tended to be gradually displaced by reptiles as time progressed), and some (including Prionosuchus) resembled crocodiles without armor.